DECKED out in a smart black jacket with a silver fern and “NZ” embroidered on it, Rona McCarthy glides effortlessly across the dining room of her Hastings home to the lounge. She returns, clutching a Wiltshire knife with an ivory-coloured handle and a stainless steel blade between her nimble fingers. “This is what we used to use [to] dig holes for ourselves and we ran on grass,” the spritely 94-year-old says, placing the knife next to an array of medals, badges and trophies she has accumulated in an illustrious life of sport. For a 19-year-old Rona Tong in February 1938, like other athletes at the then Empire Games, the knife was a standard requirement for digging foot holes on the 80-yard hurdles track at the Sydney Cricket Ground in an era devoid of starting blocks. “As a matter of fact, it was harder in those days. When our race was over, we had to walk back and put the clogs of soil back in for the next race,” says the great-grandmother who went on to clinch the bronze medal in her event, behind gold medallist Barbara Burke, of South Africa, and Isabel Grant, of Australia. The 1938 Games, from February 5-12, were timed to coincide with Sydney’s sesqui-centenary (150 years since the foundation of British settlement in Australia). The Empire Games underwent the metamorphosis to Commonwealth Games in 1954. The humidity, men’s oversized tank tops and wobbly medal dais draped in a Union Jack-type material, paled in comparison to the 21/2-day journey to Sydney on the Wanganella ship, emanating from Wellington. “Everyone was sick because it was one of the roughest crossings,” she reveals of the eight-member women’s team who were part of the New Zealand contingent in that Games. “We’d have wobbly legs for the next few days after that awful trip but we were all athletes and knew what we had to do,” says McCarthy, adding they had to put aside nausea and fatigue to meet the Australian Governor-General and his wife on the ship’s lower deck soon after arriving in Sydney. “We were dying to get to the upper decks for some fresh air. An 80-yard hurdler, who “filled in” over the 100-yard distance in sprinting, McCarthy didn’t have the luxury of coaches. “I was thrilled to win bronze “because I was self-coached mostly,” she says fondly recalling waiting for the “film replay” on the screen to see what her position was after clocking 11.8 “seconds, 0.1sec behind Grant and English-born South African Burke, who both clocked the same time. Her parents, the late Oswald and Florence Tong, were undertakers and her father a keen skater. McCarthy realised her potential as a sprinter at the former Hastings High School (where the Hastings Boys’ High School is now, but it was then a co-educational institution). She suddenly goes off on a tangent, vividly recalling that fateful day – 11.15am on February 3 1931-her first day at high school when the earthquake rocked the Bay’s foundation. It was the initiation ceremony for the “new boys” (she couldn’t recall why the girls didn’t have one) and they were on the field when everyone screamed and ran off home. 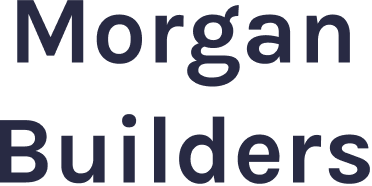 Oswald Tong, whose business was next to the Hawke’s Bay Herald Tribune, jumped from a two-storey building. “The Herald Tribune had collapsed on his car but he still drove the damaged car to pick me up from school. I’ll never forget that day,” McCarthy says. The girl who thought she could run fast was rapidly becoming bored of 100-yard dashes and wanted something different. Her father obliged, taking her to the public library where they researched to find South African women were into hurdling in a big way. Hastings hurdler, the late Frank Sharpley, offered some tips and McCarthy’s father built some makeshift hurdles for practice in their backyard. She excelled and invitations from Dunedin, Wellington, Wanganui and Rotorua followed to exhibit the discipline to other women. “A lot of women wanted a change from just sprinting and they were getting tired of long jumping too,” McCarthy says. She remembers her parents driving her to the trials for the Empire Games in Wellington but things turned pear—shaped. In her heats, McCarthy shot off to the sound of the starting gun but tumbled head over heels at the first hurdle. Her father wasn’t amused either, she says with a laugh, recalling how he had turned to her mother to say they didn’t have to travel “200 miles” to watch her fall over the first hurdle-they could have done that at home. As the names for the last heats were read out, McCarthy was delighted to find officials had offered her another lifeline. She was in awe of the South Africans and approached a male hurdler during the games at the SCG. The next day he made her jump the hurdles twice. “He couldn’t fault me but he said I had one problem – ‘You need your shorts to be three inches shorter’, ” she reveals with a grin. Conceding it was fashionable to wear three-quarter shorts then, McCarthy didn’t waste time altering her shorts. Her sewing classes at school came in handy earlier because the women had to tack the shoulder straps of their “men’s vests”. Ironically, she later became a dressmaker, working for Mademoiselle Bignon, who ran her business near the current new courthouse building. The medal ceremony was moving because her mother was in the stand at the SCG. Her father couldn’t make it because of his business. “Dad was so delighted. Everybody here stopped him in the streets everywhere he went to congratulate him. McCarthy later married the late Leslie McCarthy, an accountant, who was a cricketer and rugby player. She was also an accomplished Bay representative netballer and basketballer who made the cut for national honours but matches against Australia in both codes didn’t materialise. “The Australians didn’t want to play us because of a disagreement over the rules,” she explains, adding the seven player/nine player format was a sore point. McCarthy believes the Kiwis are doing “exceptionally well” in India. While the Games have “become faster”, it rankles with her that it’s more cut-throat too. “I don’t like to use the word rougher but everything is: ‘I want that ball and that’s all there is to it’,” says the former past president of Kia Toa Bowling Club who received an MBE from the Queen in 1979. Her only child, daughter Karin Campbell, of Hastings, didn’t want to hurdle but enjoyed sport. Having coached athletics and netball for almost 40 years, the life member of Eastern Netball does volunteer work for the Red Cross and Returned Services Association. Only three months ago, a Red Cross colleague Googled photos of the 1938 Empire Games women athletes and printed them for her. “It brought tears to my eyes,” she says, rolling out the prints on her dining table. She fondly recalls having received Christmas cards from sporting acquaintances. “It’s sad but nowadays Christmases go by and cards don’t arrive,” says the grand old matriarch of Bay sports as she nears the ton in the game of life. 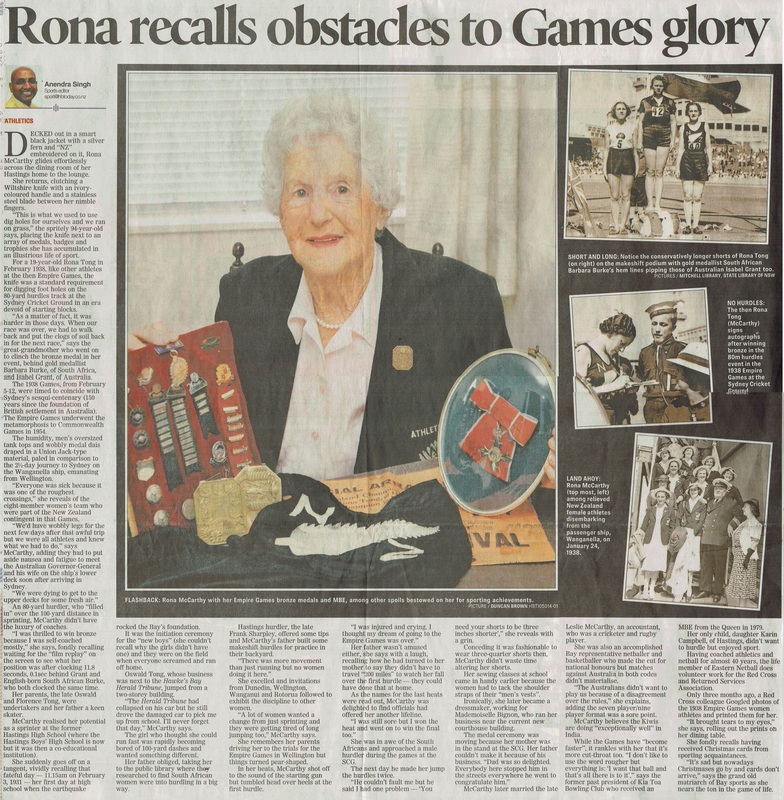 Photo captions – FLASHBACK: Rona McCarthy with her Empire Games bronze medals and MBE, among other spoils bestowed on her for sporting achievements. NO HURDLES: The then Rona Tong (McCarthy) signs autographs after winning bronze in the 80m hurdles event in the 1938 Empire Games at the Sydney Cricket Ground. LAND AHOY: Rona McCarthy (top most, left) among relieved New Zealand female athletes disembarking from the passenger ship, Wanganella, on January 24, 1938.